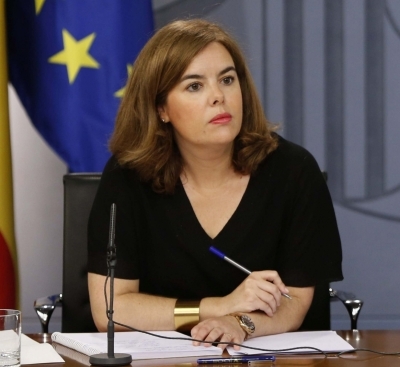 Madrid, Oct 27 (IANS) Spanish Deputy Prime Minister Soraya Saenz de Santamaria confirmed on Thursday that the government would proceed with its plans to apply Article 155 of the Spanish Constitution to the region of Catalonia, sacking the government of Carles Puigdemont and taking control of key regional institutions. Speaking at the Senate at the start of the debate, Saenz de Santamaria said: “We are fulfilling a legal, democratic and judicial obligation: the obligation any government has in ensuring its laws are respected,” adding that applying the article would “mean the end of political disobedience” in Catalonia. She made her speech just moments after Puigdemont gave an institutional speech in which he ruled out calling regional elections in an attempt to prevent Article 155 being applied, Xinhua news agency reported. Puigdemont admitted he had “considered the possibility of calling elections” whenever there were guarantees, but lamented “no guarantees had been forthcoming”. The Senate will approve Article 155 on Friday before a meeting of Prime Minister Mariano Rajoy’s cabinet. Meanwhile, the Catalan Parliament will now debate its response to Article 155, with a possible declaration of independence on Friday unless there is further last-minute mediation.